All transactions are safe and secure with a reliable history in online purchasing behind each of our associates. 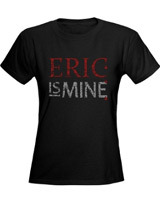 Buy the Eric is Mine t-shirt to own True Blood clothing and merchandise. What is the best way to protect your human from hungry vampires? Claim them. "Sookie is mine", as stated by Bill, is the only thing that kept her from being devoured by his fellow vampires, including Eric Northman (Alexander Skarsgard) who wanted her in his vampire club Fangtasia. This design turns the tables on the vampires and lets everyone know that Eric, the hottest vampire in Bon Temps, belongs to you. Enjoy your favorite True Blood episodes wearing this piece of vampire merchandise. Pair it with a Sookie is Mine True Blood tee today. In addition to the Eric is Mine tee above, browse the True Blood Clothing Gallery for more apparel like men's and women's clothes, kids shirts or hoodies.